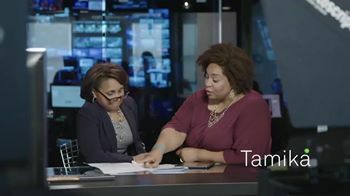 My Under Armor: Do you know about lymphedema? There’s a popular athletic apparel out there called Under Armour. It’s stylish, super comfy, and great for exercising! My under armor is not stylish at all, not too comfortable, and I don’t wear it for exercising. I wear it to protect against infections caused by lymphedema. When I was first diagnosed with cervical cancer, the goal was to survive. No one mentioned lymphedema. While going through chemo and radiation, the goal was to make sure all cancer was gone. No one mentioned lymphedema. During the first couple of years after treatment, the goal was to make sure HPV and cancer did not reoccur. No one mentioned lymphedema. Then my leg began to swell and I started getting cellulitis infections … the doctors mentioned lymphedema. When I was first diagnosed with HPV and realized how common it is; I remember thinking, “How can this virus attack so many of our bodies, and I’m just learning about it?” When my leg began to swell and I was hospitalized with infections; I learned about the amazing lymph system. I remember thinking, “I’ve heard of lymph nodes, but a whole system? Who knew!” Perhaps I should have gone to medical school! The lymph system is an amazing part of our bodies! Imagine delicate, little vessels running all over your body connected by lymph nodes – congregated (mainly) in the neck, under the arms, in the groin, and abdomen. Some are close to the surface of your skin, others are deep inside. These vessels carry a protein-rich fluid called lymph which is passed through the lymph nodes to rid your body of toxins, waste, and other unwanted materials. It’s a pretty important system! My cancer treatment included a radical hysterectomy along with the removal of 20 lymph nodes in my lower abdomen. Even though our bodies contain hundreds of lymph nodes, a handful of missing ones can alter the effectiveness of the whole system. It simply doesn’t perform as well because the lymph fluid doesn’t get pumped as efficiently in order to rid the body of toxins. About two years after I finished my cancer treatments, I noticed my left ankle and thigh were a little swollen. Not much, but enough for me to notice a difference and become paranoid that something was wrong. This is when I first heard about lymphedema. My doctor referred me to a physical therapist who specializes in lymphedema, and she taught me some self massage I could do to stimulate my lymph system and keep it moving. It helped with the swelling, and soon I stopped the self massage. About a year later, I had my first cellulitis infection which hospitalized me for four days. Cellulitis can be a common occurrence with lymphedema. The lymph system gets backed up, which means the toxins aren’t eliminated efficiently, and bacteria can grow causing infection. Over the last five years, I’ve had six cellulitis infections; all of which have hospitalized me from 2-7 days. Once released from the hospital, I usually have to go and get daily antibiotic infusions for about two weeks. Each infection damages the lymph system even (a little bit) more which makes me more prone to the infections. It’s a vicious cycle, and it isn’t fun. However, I’ve learned to listen to my body and know when an infection is coming so that I can act quickly to minimize the complications. Lymphedema is a condition that doesn’t go away. I will always have it. However, there are things I do everyday to manage it in order to keep swelling down, avoid infections, and ultimately keep the lymph fluid moving throughout my body. This is where my Under Armour comes in handy. Everyday from the time I wake until I go to bed, I wear prescription compression hose that go from my toes to the top of my thigh on my left leg. I also wear compression shorts that go from mid-thigh up to just under my bra. This compression provides gentle pressure which helps to keep the lymph fluid moving. It interferes a bit with my wardrobe, but I’ve learned to fashionably adapt. On the bright side, the compression garments give me somewhat of a slimmer and smoother look. In addition, every night at bedtime I spend about 20 minutes doing manual lymph drainage massage. Lastly, once a month, I get a lymph drainage massage from a therapeutic massage specialist. No one mentioned lymphedema when I was first diagnosed with cancer. I’m not saying they should have; the focus was surviving cancer. Plus, lymphedema doesn’t happen to all patients who have had lymph nodes removed. Even though my case is mild, lymphedema has become one of the main “after-effects” of cervical cancer that I deal with on a daily basis. It is cumbersome (literally) and overwhelming at times, but I know it’s what I need to do to stay healthy. And, I suppose, it’s a small price to pay to be cancer free. 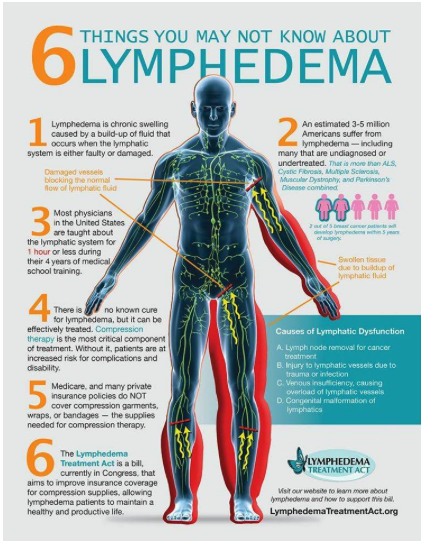 If you have signs of lymphedema, please contact your doctor in order to get the best care possible! You may have heard my story before. The quick version – I was diagnosed at age 25, had a radical hysterectomy shortly after my diagnosis, and was left infertile and depressed, certain that no one would ever marry me. But my story is just one of many cervical cancer stories. There’s Christine. She was diagnosed at 30, also had a radical hysterectomy with chemo and radiation, and ended up without the ability to have children with her husband. Heather. She had two young kids when she was diagnosed, a happy life as a 5th grade teacher, and a rough treatment schedule that left her exhausted and worried about leaving her young family without a mom. Kelly. She was a gymnast, a newlywed, a woman passionate about following her dreams, and a woman who died from cervical cancer at the age of 33. And there are many more stories…some of women who have gone on to have wonderful full lives and some of women who died way too young from a disease that we can now prevent. I was lucky that my cancer was found early. And women today are even luckier because we have new and improved tools to help protect us from this disease! If you’re 26 or younger, or your kids are 26 are younger, speak with your healthcare provider about the HPV vaccine. If you are 21 to 29, go get a Pap test. If you are 30 or older, go get an HPV test. You may end up getting an HPV test and a Pap test, or just an HPV test. Either option is effective. If you have HPV or your Pap is abnormal, keep checking in with your doctor or nurse. Get re-tested or get treatment if needed. Even if you’ve been vaccinated, you still need to get tested. Don’t let MY story be YOUR story. Don’t let Christine’s story be your best friend or sister or mom’s story. Don’t let Heather’s story be the story of your neighbor or cousin or daughter. And don’t let Kelly’s story be any woman’s story ever again. Get vaccinated. Get tested. And if needed, get treated. Help us to eradicate cervical cancer so no other woman has to suffer or die from this preventable disease.